China has taken an increasingly influential role in Nigeria. Trade between the two countries totalled $8.2 billion in 2011, just behind Angola and South Africa, this figure has rapidly increased over recent years. While China has an interest in Nigeria’s oil and gas industry, there have also been investments in real estate, infrastructure and communications. China even supplied a satellite to Nigeria, which despite initially breaking down, is now a useful tool for the nation. There are signs Nigeria’s economy is becoming less dependent on oil, with growth in areas like mobile phones and consumer goods. Mobile phone subscriptions have gone from virtually zero to 63 million in 10 years and there remains further room to grow, given Nigeria’s population of approximately 170 million. The banking sector has restructured after a recent crisis and is now better capitalised and more robust than five years ago. 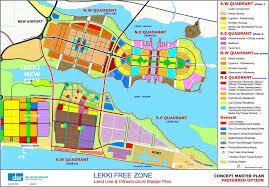 One promising development is the setting up of the Lekki Free trade zone. The zone is partly modelled on Chinese special economic zones, which were a powerful catalyst for industrialisation in Shenzhen and Guangdong twenty years ago. The Lekki Zone will be tax free and foreign companies will be allowed to retain all their profits and remain 100% foreign owned. The Zone will be more secure than chaotic Lagos and will benefit from the legal and regulatory arbitrage of being next being next to Lagos, but separate. Crucially it will hopefully be able to escape from the institutional failure of government agencies and ministries, which has held Nigeria back for so long. Chinese firms are heavily involved in building of the site, (primarily: China Civil Engineering Corporation, China Railway, Jiangjing Development Corporation and Nanjing Beyond). The Lekki zone has a major advantage over other similar zones in Nigeria and Africa, it is located by the sea and near to central Lagos are therefore has the capacity to be a major export and logistics hub. Large numbers of Chinese entrepreneurs have also been highly adventurous in moving to Nigeria and setting up small businesses, shops, restaurants etc. Nigeria has a potentially bright future as the economic giant of Africa, but the complexities and political problems that beset the country, the divide between north and south, ethnic divisions, religious divisions and the oil curse all count against it. Whether the Chinese backed Lekki free trade zone can help stimulate industrialisation and economic growth or will the problems above overwhelm this initiative and the Nigeria retain its chaotic image remains to be seen. Previous Previous post: Proposed West African highway – to be built with Chinese funding?